The following limited selection of prints are available for purchase. All pieces are printed on aluminum using a dye-sublimation process that highlights color and contrast and makes the photos pop. These are limited edition, signed prints. Sizes and prices are noted below. Storm are some of nature’s most beautiful and awe inspiring creations. At the same time, they create a certain ominous feeling. 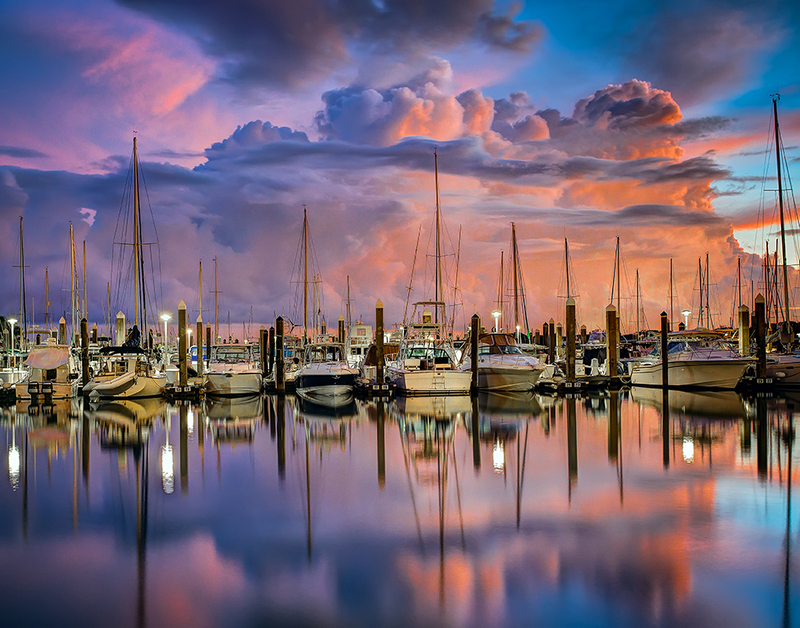 In this scene, the storm clouds gather and create a beautiful reflection on the still waters of this harbor in south Florida. Perhaps my most striking image, the colors of this piece leap off the metal. At the same time, the composition and lighting create a sense of calmness and serenity. As a result, this was image selected to the esteemed Loan Collection by the Professional Photographers of America in 2017. This is my largest piece, measuring 40 x 30 inches. It is a limited edition of 100. It is printed on aluminum with a recessed metal frame on the back for easy hanging in your home or office. The piece will appear to be floating about an inch off the wall. This scenic vista depicts what is often referred to as the first Spanish landscape painting, which was done by El Greco at at time when landscape paintings were actually banned. It overlooks the ancient city of Toledo, which was the original capital of Spain. The detail in this photo will amaze you, and could not have been created with a single photograph. Instead, this piece was created by combining several different digital images together in to one photograph (all taken at the same time). As a result of this additional level of detail, you will consistently discover new elements within the city that you hadn’t noticed before. This photo captures the view from one of Spain’s most famous intersections from atop the Circulo de Bella Artes in Madrid. The name of this piece comes from the name of the road that cuts through the scene: Gran Via. While the scene is iconic, the moment is one in a million. It starts with the overall lighting, as it was taken in the moments between daylight and darkness, when the lights are on but there is still enough light to see the sky. Importantly, this moment was captured immediately following an intense storm, so you have clouds in the background adding to the ambiance. This adds a magical element to an already iconic scene. This piece measures 24 x 36 inches, printed on a metal sheet with a recessed metal frame. Limited to 100. 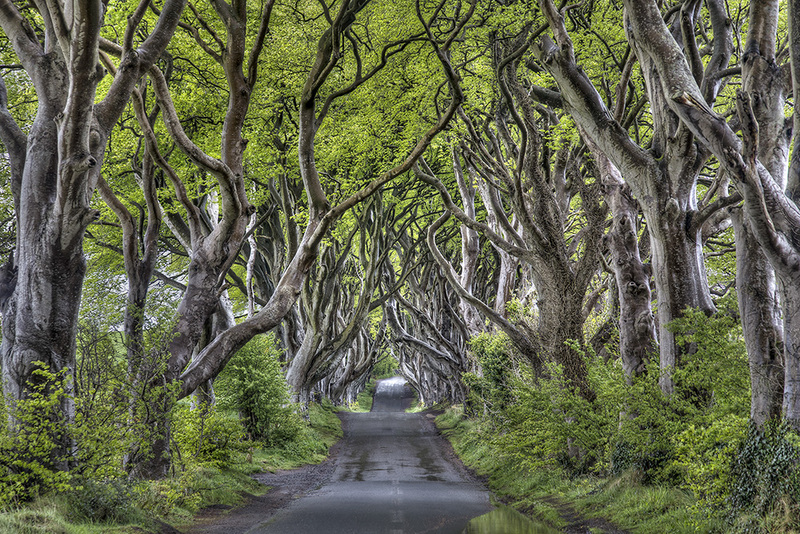 Commonly referred to as “Dark Hedges,” this location was used in the filming of Game of Thrones. While the road leads you straight into the heart of the picture, the branches create foreboding and an element of mystery, along with a sense that the journey will not be an easy one. The photo was taken just after rain showers, which results in the soft lighting that creates a sense of peacefulness to go along with the mystery. The water from the rain adds additional interest to the foreground elements. The scene, timing, and composition result in a spectacular piece, and also resulted in this image being selected to the esteemed Loan Collection of the PPA. This piece measures 24 x 36 inches, printed on a metal sheet with a recessed metal frame. This is a limited edition (100). A towering hall full of ancient books and manuscripts seems like something that can only exist in a faraway magical kingdom. Nevertheless, such a place exists in the Long Hall of the Old Library in Trinity College. Along with the sense of mystery from the ancient tomes on the shelves, the lines created by the library create a dynamic scene that leads you into the scene. At the same time, you get a strong sense wonder and the history of the place. Who wouldn’t want to spend a day here digging through the books? Or a month? This piece measures 24 x 36 inches, printed on a metal sheet with a recessed metal frame. This image was selected to the esteemed Loan Collection of the PPA. The edition is limited to 100. This photo of the herd of cattle returning to the barn is both scenic and serene, invoking a sense of the slow-paced lifestyle many of us yearn for. The prominent sky adds drama and interest, along with a sense of the wide open nature of the Texas pastureland. This photo is the centerpiece of my Texas collection and is one of my most sought-after pieces. This piece measures 24 x 36 inches, printed on a metal sheet with a recessed metal frame. This is a limited edition (100). This unique photo of downtown was taken after dramatic flooding. The water in the foreground is the Trinity River, well over its banks. This was the worst flooding seen in many years, and it is not something likely to be repeated anytime soon. It adds a dimension to the photo that is lacking in standard skyline photos. This piece measures 24 x 36 inches, printed on a metal sheet with a recessed metal frame. The edition is limited to 100. Additional metal pieces are available. Smaller prints on photo paper with mats are available as well. To get one, come check out one of my shows.